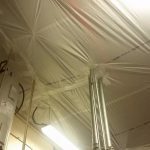 Because of the loyalty of our customers, SealWrap has been growing rapidly and because of this, we have been concerned for the safety of the employees and the facilities. 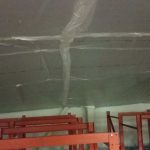 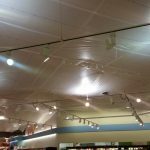 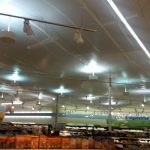 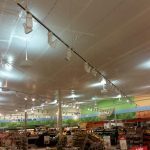 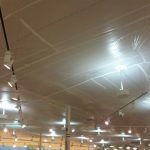 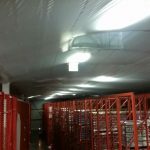 Fire marshals, safety personnel, insurance companies and our customers had concerns regarding the effects of the sprinkler system when the suspended cover is installed. 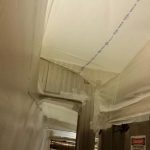 For that reason, SealWrap invented SprinklerSeam. 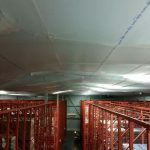 After two years of development, SealWrap has teamed up with manufacturers, engineers, and product test facilities in the making of a suspended cover that provides a competitive edge in the growing containment industry. 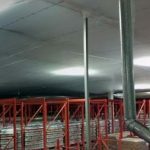 SealWrap is proud to announce the developing and the making of SprinklerSeam which is now available for our clients and the world serving as a sprinkler solution barrier. 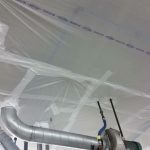 SprinklerSeam is a heat-sensitive seam that bonds with Reinforced Poly Sheet and a combination of heat activated threads to form heat activated seam. 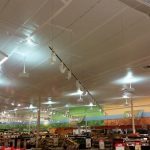 The SprinklerSeam reacts and activates by fire heat, allowing the suspended cover to break apart so the fire sprinkler can function as designed. 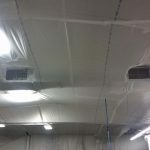 SprinklerSeam Solution “suspended cover” had to be certified and classified to meet the NFPA 13 Standards. 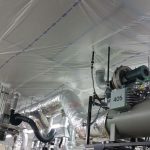 SealWrap was able to conduct several tests with MET Lab and through multiple field tests, SprinklerSeam is now being used by American recognized facilities and manufactures throughout the nation.